"Enough is Enough—We're Going to Ecuador"
It's no surprise that expats are drawn to Ecuador because of its close proximity to the U.S., near-perfect weather, and low cost of living. “Who remembers the economic tsunami of 2008?” Edd Staton asked. As Edd tells it, he and his wife Cynthia had enjoyed long successful careers. But then came the recession. Edd and Cynthia were both “downsized” and were working in sales jobs in Las Vegas when Cynthia was downsized for the second time. Enough is enough, they decided. It was time to stop putting life on hold and time to start living it. “We saw the value of our savings plunge just as we were nearing retirement age. Rather than remain in the States and continue to work for too many more years trying to correct this problem, we made the decision to relocate so we could retire and enjoy the rest of our lives,” Edd says. Edd and Cynthia decided that they weren’t willing to sacrifice the retirement lifestyle they’d always dreamed of. But in order to “rescue” their retirement years, they’d need to move to a place with a far lower cost of living. After lots of research (and yes, soul searching, too), they decided on Ecuador. It’s a tale with a classic storybook outcome. 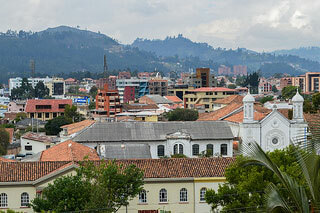 Drawn by the fact that Ecuador is close to the U.S. (just a four-hour flight from Miami), has near-perfect weather and a substantially lower cost of living, Edd and Cynthia found their way to the southern Ecuador city of Cuenca. Fortunately, in Ecuador, Edd and Cynthia no longer have to worry about having enough money to do the things they want to do. This wasn’t the only story like this we heard today…. I’m Suzan Haskins, reporting from the 2014 International Living Fast-Track Ecuador: Lifestyle and Opportunity Conference in Quito. I’ve been to a lot of conferences in a lot of countries over the last several years but this one is remarkably different. In Ecuador, you can have it all, as I mentioned yesterday…and if you ask me, that’s kind of the unofficial theme of this conference. Global real estate expert Margaret Summerfield shined the spotlight on how to avoid the most common mistakes foreign property buyers make. (That’s us, folks…but it doesn’t have to be.) Today we got some hard-won tips and advice. Eleven of them. Do not miss these if you ever might consider buying property in Ecuador. Ecuador attorney Dr. Roberto Moreno explained how to legally structure your property purchase in Ecuador (it’s absolutely safe, but the legal system here is different than you’re used to, so these are need-to-know tips). He recently helped a foreign tourist obtain a mortgage loan using the property as collateral—that’s a big deal and an important thing to know about! Expat Wendy DeChambeau shared her family’s experiences moving young children to Ecuador. How did she and her husband help them integrate into the culture? What about language issues? Education? Health care? Truthfully, the insights Wendy shared are pertinent to all of us, children or not. And we lived vicariously through expats living in Quito, Cuenca, and in two separate beach locations. Hearing the stories of others who have successfully restarted their lives and rescued their retirement dreams by moving to Ecuador is one of the biggest benefits of this conference. These expats are generously sharing their experiences here, both good and bad. Not one of them has anything to gain financially by doing this… They purely want to help you do what they’ve done here in Ecuador: find happiness, security, adventure, and a real sense of community. How Can You Get Your Hands On These Tips and Secrets? And we want to get this information into your hands as quickly as possible. So we’re putting together a complete package of everything that’s happening at this event. We’re making audio recordings of all the presentations. We’re also making copies of the conference workbook, PowerPoint and visual presentations. We’re including the complete information packet we give to all the attendees when they showed up here in Quito. We call it our 2014 Fast-Track Ecuador Package. And we guarantee it will help you fast track your plans of moving to…or investing in…one of the top retirement destinations in the world—Ecuador. How to navigate residence issues, where the country’s most temperate climates are found, how to structure a real estate purchase here—and importantly, what the going prices are now, thanks to market corrections driven by the worldwide recession. Editor’s Note: Learn more about Ecuador and other countries in our daily postcard e-letter. Sign up for IL’s free daily postcards here and we’ll send you a FREE REPORT – Ecuador: Live Like Royalty on Your Social Security.